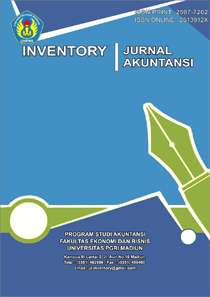 INVENTORY: JOURNAL ACCOUNTING is a medium of scientific communication in Accounting published by Universitas PGRI Madiun which published two (2) times a year that is in April and October. INVENTORY : JOURNAL ACCOUNTING has regitered number ISSN: 2597-7202 (Print) and 2613-912X (Online). Contains the results of thoughts and research results in the field of Financial Accounting, Management Accounting, Public Sector Accounting, Information Systems, Taxation, Sharia Accounting, Behavioral Accounting, Investment and Portfolio Analysis, International Accounting and Entrepreneurship. Author can submit manuscript by doing online submission. Author should prepare their manuscript to the instructions given in AUTHOR GUIDELINES before doing online submission. Template of article can be download in right sidebar. All submissions will be reviewed and evaluated based on originality, technical research, and relevance to journal contributions.